As standard for Ortovox, The outdoor rucksacks have all been designed for safety in mind, with integrated safety compartments for quick access to your avalanche shovel and probe in the case of an emergency. 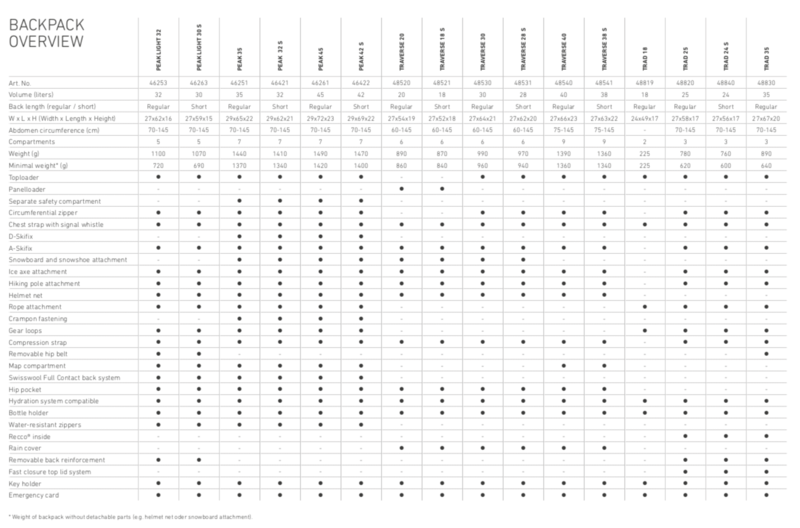 For more information about which back length measurements suits you, please click the more info button above to head to the bottom of the page. 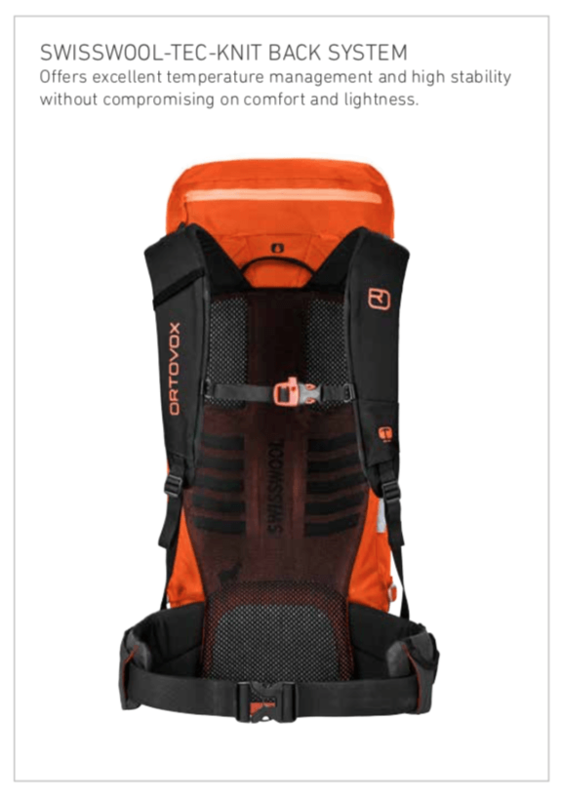 Ortovox developed their first backpack model in 1981 and continue to offer high functionality within their avy backpacks, made from the highest quality material and innovative details, the Ortovox packs are by far one of the best on the market. 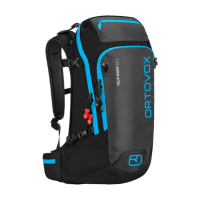 Ortovox has years of design experience and has established standard features to there outdoor backpacks such as integrated back protectors, integrated safety compartments which allow quick access to the emergency equipment and access to the main compartment via the back system. 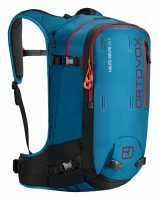 Today Ortovox backpacks stand for the highest quality, innovative details, functionality as well as unique design, based on a vast wealth of experience. 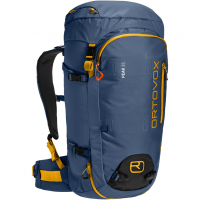 Ortovox has Noticeably Improved the entire Free Tour backpack Range over the years, with Many Carefully Considered Features. All of the freetour packs offer Access To The Main Compartment From The Back, combined with the foam back and ergonomic straps which allow you to balance weight distribution. With Diagonal and Side Ways Ski Fastener as well as a Helmet Fastener. Ortovox has made Quick Access To Your Emergency Equipment obligatory. Also added are Ice axe and snowboard fasteners and a more improved hydration system storage compartment. An Extremely Tear-Resistant and robust fabric. Polyurethane treated for improved water resistance. Ortovox protects was the guideline principle and central focus during the development of the freeride series. This downhill series was built for Freeriders in mind. 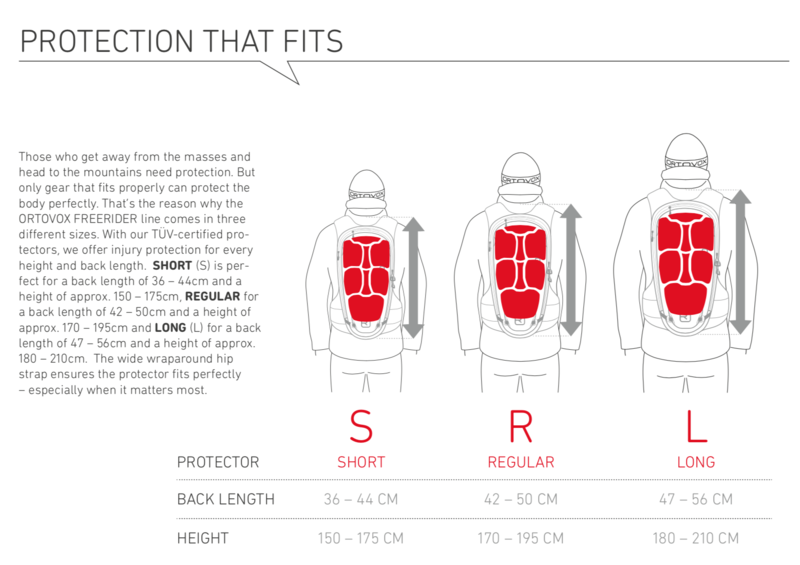 With integrated SPS Flex Back Protector, the back system of the pack has been designed for flexibility, Build from Eight Pads that remain comfortably flexible even in the cold. The TÜV-certified protector adapts to the body and absorbs impact. Ortovox has integrated SAS-Tec protective foam for high impacts and force, the Viscoelastic foam quickly returns to its original shape. The SAS-Tec foam can Withstand Multiple Impacts and will not destroy the protectors. Cushioning occurs in near-linear fashion, which keeps stress on the human body low. The Ortovox Freeride Series also has new features such as Ski and Snowboard Fastenings and fully-integrated Helmet Net (this reduces weight on the contrary). The free-ride series weight has been significantly reduced to produce lightweight backpacks. The distinctive ripstop interlocking tread pattern and a PU coating for Greater Water Resistance result in Higher Abrasion Protection and Tear Strength. From a visual perspective, the relief-like surface structure has a very technical appearance. it is a design that doesn't compromise longevity. A piece of very robust and high-quality nylon fabric with a High Weave Density. The PU coating on the inside makes the fabric waterproof. The reason why the Ortovox Freerider Line comes with the TÜV-certified protectors is that those who get away from the masses and head to the mountains need protection. 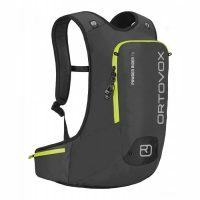 The Ortovox Freerider line comes in three different sizes to offer injury protection for every height and back length. 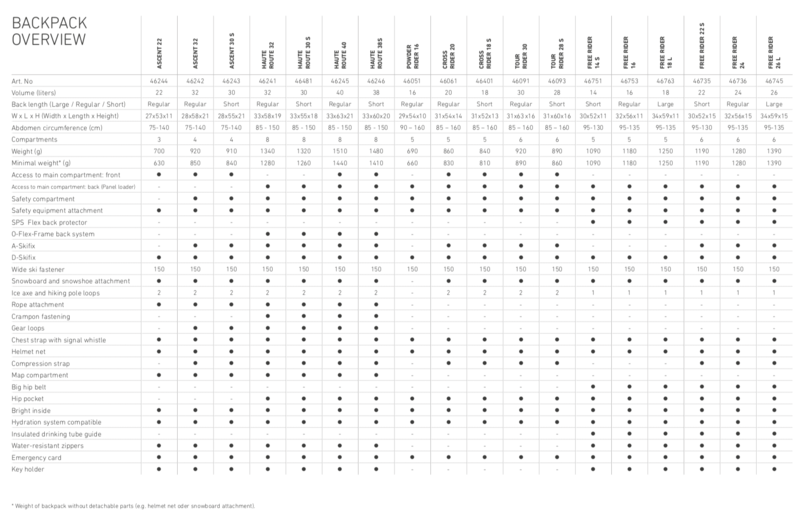 Please see the following sizes and backpack range. SHORT (S) is perfect for a back length of 36 – 44cm and a height of approx. 150 – 175cm. LONG (L) for a back length of 47–55cm and a height of approx. 180-200cm. The wide wraparound hip strap ensures the protector fits perfectly – especially when it matters most. 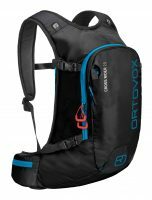 The Tour Series has been around since the birth of the Ortovox backpacks, a tried and tested line offers high volume packs designed for Long Ski Excursions Lasting Several Days. all of the tour series offer a top and back access to your ski touring avy gear and avalanche safety essentials. Also including load control straps and the O-Flex Back System, which distributes the load optimally between the hips and shoulders and ensures maximum wear comfort. These touring bags also feature crampon fastening, fixed helmet net and a map compartment as well as rope fastening. SKI TOURING CLASSIC. The high-strength nylon yarn is robust and Abrasion-Resistant, yet Lightweight. Longevity and protection are the main characteristics of this fabric. The PU coating on the inside makes fabric Waterproof. Most Durable material. it offers Extremely High Scruff Resistance and is therefore ideal for protecting against sharp edges. The PU coating on the inside also makes the fabric waterproof. Are high alpine challenges calling you this summer? Weather on Dent Blanche surrounded by its mighty glaciers or on the protruding Weisshorn in the Valais Alps, the new High Alpine Series is the go-to pack for demanding alpine tours. It is extremely lightweight, technical and even more functional with the new Swisswool Tec-Knit Back System. In an innovative method, Ortovox combines the foam and pressed Wiss wool covered with a high-tech knitted fabric with a different hole structure. This processing enables excellent Temperature Management and Maximum Comfort. The Peak Light allows you to remove the hip belt, ice axe holder and the lid compartment for Maximum Weight and Maximum Function. Thanks to the distinctive ripstop interlocking thread pattern, the fabric is Very Tear and Abrasion Resistant and therefore Long-Lasting. The fabric also impresses with its lightweight. The PU coating on the inside makes the fabric waterproof. 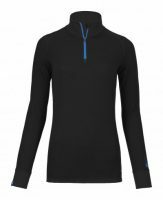 In the Swisswool Tec-Knit Back System, Ortovox Combine foam and pressed swiss wool covered with a High-Tech Knitted Fabric with a different hole structure. In areas with lots of back contacts, we have used Swisswool Pads with a larger hole structure. This means that the wool can absorb moisture (sweat) much faster and is simultaneously More Breathable and Feels Dry on your back, Even during sweat-inducing climbs. Ortovox has placed foam in areas with less back contact to offer more Stability and better Wear Comfort.